Quickly find out how to end your pain & suffering! Stop a gallbladder attack in 24 hours, safely and naturally. Easy to follow steps and homemade gallbladder cleanse remedies that work. Surgery does not prevent new gallstones from forming. Did you know you can dissolve gallstones without surgery? Many people suffer the discomfort of gallstones. Watch video testimonials of our satisfied (elated) customers, and learn about their experiences. The Pulverexx Protocol is an all-natural program that can stop a gallbladder attack under 24 hrs.. It is also a fatty liver cleanse and gallbladder detoxification program. The Pulverexx Protocol is a unique approach to gallbladder and liver health. It combines the wisdom of ancient Amazonian cultures with today’s healing modalities. The Pulverexx Protocol is not a pain management program, nor a means to merely mask symptoms; It is a pain elimination program, and a gallstone dissolution and removal protocol with a long-standing track record of success. It is the most effective natural gallbladder treatment in the market today. The Pulverexx Protocol vanquishes pain in record time and at the same time addresses the its underlying cause, thus preventing any future painful attack episodes from reoccurring, as well as averting potential future development of more serious medical conditions. The Pulverexx Protocol does not deal with gallbladder symptoms by masking them. It addresses their root cause by dissolving and eliminating obstructions, such as gallstones, fatty liver deposits, collagen deposits, stagnant bile, sludge, mucous, toxic accumulation of chemical residues or drugs in the liver, gallbladder, bile ducts and mouth of the pancreas that can be the source of gallbladder problems and other symptoms and serious ailments. Over the years, the liver and gallbladder become filled with crystallized or hardened deposits that are commonly referred to as gallstones. Gallbladder stones grow in size over time and are particularly common in those with poor dietary lifestyle habits and dietary choices; more so in those with high protein diets. Gallstones and fatty liver deposits are increasingly prevalent in smokers, alcohol drinkers and those who have engaged in recreational drug abuse, as well as in those who have been on medications for extended periods of time. When gallstones have grown enough in size or in numbers, they can press against areas of the gallbladder and produce exceedingly painful symptoms, which may include sharp pains on the right side of the abdomen underneath the ribcage, ‘referred pain’ in the back and shoulders, and sometimes they can mimic some of the symptoms typically felt during a heart-attack. The Pulverexx Protocol is the most effective means to stop a gallbladder attack, as well as eliminate the underlying cause that may lead to the myriad of gallbladder symptoms. The Pulverexx Protocol may stop a gallbladder attack under 24 hrs.. The Pulverexx Protocol begins to dissolve gallbladder stones immediately whether they are cholesterol or calcified gallstones. Cholesterol gallstones are much easier to be dissolved. Calcified gallstones are much harder. The Pulverexx Protocol dissolves both of these stubborn formations. The Pulverexx Protocol may work on gallstones up to 1” (2.5 cm) in or 1 ¼” (3.2 cm) in diameter. The Pulverexx Protocol is a program that dissolves gallstones and toxic deposits, whether they are found in the liver, gallbladder, common bile duct or at the mouth of the pancreas. The Pulverexx Protocol is good for people of all ages. The Pulverexx Protocol vanquishes gallbladder pain by dissolving stubborn gallstones. It may stop a gallbladder attack in as little as 24 hrs.. Since most people resort to gallbladder surgery only as a last ditch effort to stop the excruciating pain, the Pulverexx Protocol reduces or eliminates the need for gallbladder surgery. Furthermore, because even after gallbladder surgery gallstones may still be present in the liver, where gallstones start to be manufactured, the surgical removal of the sack where many of the gallstones are stored does not exempt one from pain in the future. In fact, studies show that up to 50% of patients that have undergone surgical gallbladder removal return to their surgeons with the same gallstones pain and gallbladder symptoms they felt prior to the surgery. The same gallstones symptoms may return even years after the surgery. In some instances, gallbladder pain and symptoms have returned 10 to 15 years after the gallbladder removal. The Most Powerful Fatty Liver Detox on The Market Today! Residues of toxic accumulations, pesticides, detrimental food additives, chemical contaminants, drugs, and metabolic waste can be found stored in organs and tissues across the body. Wherever they accumulate, they interrupt the normal organ functions and processes and eventually cause ‘dis-ease.’ The main cause of disease is not a defective genetic make up, but a condition of toxemia or autointoxication. One of the liver’s many functions is to purify the body of waste and toxicity. When you clean the liver, the body is gradually alleviated of its toxic load and normal healthy body functions and processes are restored. True healing can never come without detoxification of the body. The Pulverexx Protocol gradually and effortlessly clears the body of some of the toxic accumulations found in the liver and gallbladder that eventually lead to disease. Gallstones and liver congestion are very toxic and can be directly related to frequent indigestion, obesity, constipation hair fall, jaundice, migraines, high cholesterol, and high triglycerides. Liver congestion may also be related to more serious conditions such as diabetes, high blood pressure, coronary heart disease and many other ailments normally not associated with fatty liver symptoms. Since all drugs, alcohol and pharmaceutical medications are metabolized in the liver, the Pulverexx Protocol is ideal for those who are smokers, steroid users, or those who have suffered from alcohol abuse, drug abuse, chemical sensitivities, and those that have been on medications for extended periods of time and desire to do a liver detox and purge residues of these compounds that are still in their bodies. An alcoholic liver or a fatty liver are such examples, and very predominant in individuals with a history of substance abuse. The Pulverexx Protocol is a powerful fatty liver cleanse that can help in all of these cases. It is specifically ideal for those who have a history of substance abuse such as alcohol, drugs, tobacco and even pharmaceutical medications that may eventually lead to liver disease. We feel that our main goal is not only help you conquer your health challenges, but to help prevent them in the future. 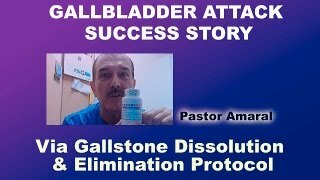 What good is it to help you dissolve your gallstones today, if we then fail to tell you how to prevent the same gallstones from forming in the future? Being a company founded on the principles of healing; if we failed to do this, we would fail our commitment utterly. So every order is sent out with this booklet. We are not interested in lifelong clients. We sincerely wish you to become more self-sufficient when it comes to your health. Besides your testimonials and recommendations of our program to your friends are much more valuable to us. The Pulverexx Protocol contains everything you need to get started in order to vanquish gallbladder pain and gallstones symptoms, as well as detoxify the liver of accumulated toxic deposits and contaminants. Most important: We focus in education not the sale, so not only will you be shipped the Pulverexx product, but you will be sent a booklet where you will be shown step by step simple instructions on how to start the program, and we will point out what lifestyle habits and dietary foods that lead to gallstone formation. The last chapter is dedicated to alternative health programs for heavy metal detoxifying, liver tonics and other health corrective actions. There is also a free gallbladder diet ebook available for download. Pulverexx contains only herbs that originate from the pristine rainforests of the Amazon. Pulverexx contains no chemicals, binders, fillers, or other additives.